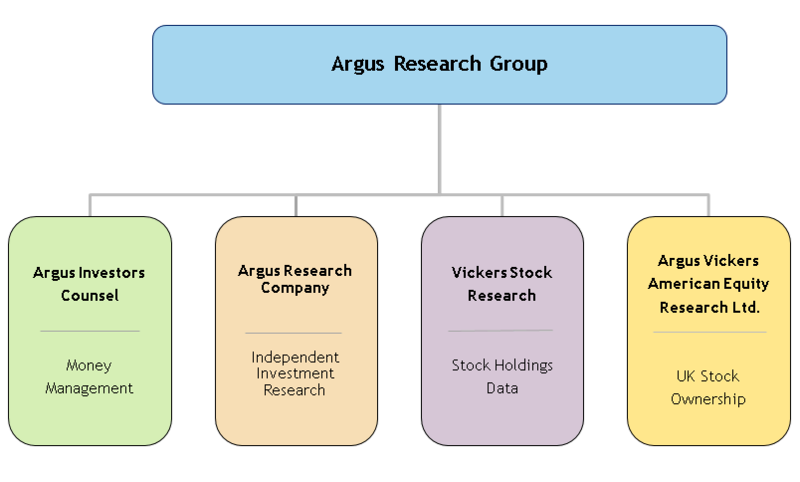 Argus Research Company was founded in 1934 by economist Harold Dorsey, and was one of the first firms to provide systematic, independent research and analysis on U.S. equities to the professional market. Using a top-down methodology, the Argus staff of analysts and its economist has continued to offer forecasts and ratings on the U.S. economy, and objective investment research analyzing hundreds of leading blue chip companies. Over the years, the company has expanded and diversified into other areas of the financial services industry. Argus Investors' Counsel, Inc. (AIC) is an SEC-registered Investment Advisor incorporated in 1960. Clients include a nationwide array of public and corporate pension plans, Taft-Hartley funds, endowments, foundations, hospitals, registered investment companies and high net worth individuals. We manage equity portfolios using fundamental research conducted by an experienced long tenured investment team supported by the deep resources of Argus Research. Our flagship core equity strategy has produced substantial active return for our clients since 1979. In 1976 Argus acquired Vickers Stock Research, which tracks stock holdings data including both Insider Holdings and Institutional Holdings. The Insider Holdings Database includes corporate officers, directors and shareholders of 5% or more of outstanding shares in a corporation. This data is derived from SEC filings. The Institutional Holdings Database includes large money managers, insurance companies, banks, U.S. and non-U.S. funds. Argus Vickers American Equity Research (AVA), located in London, was incorporated in August of 1993. AVA produces The Owners service, a comprehensive and timely ownership data base of small to mid-cap U.K. stocks. Argus’ corporate headquarters are located in New York City. Argus also maintains offices in London, England; and Stamford, CT.